In a search to explore more about what it means to be authentic in the workplace (and also wider life) I recently came across Mike Robbins’ TEDx talk on The Power of Authenticity. I am currently studying as a Person Centre counsellor and am interested in how we can apply Carl Roger’s 3 core conditions of empathy, respect and congruence in the workplace so that we can grow both as teams and personally. Congruence, aka being real or authentic, is perhaps the one I struggle with most personally, and from having spoken to others, I am not alone. Mike Robbins acknowledges that often it seems easier to say what we think other people want us to say, rather than to say what is really going on for us. We want to be liked, to fit in, to not rock the boat and risk rejection. What it takes is a willingness to be vulnerable and to share what is real for us “below the tip of the iceberg” of what we are showing to the world. Icebergs can be a good metaphor for authenticity. 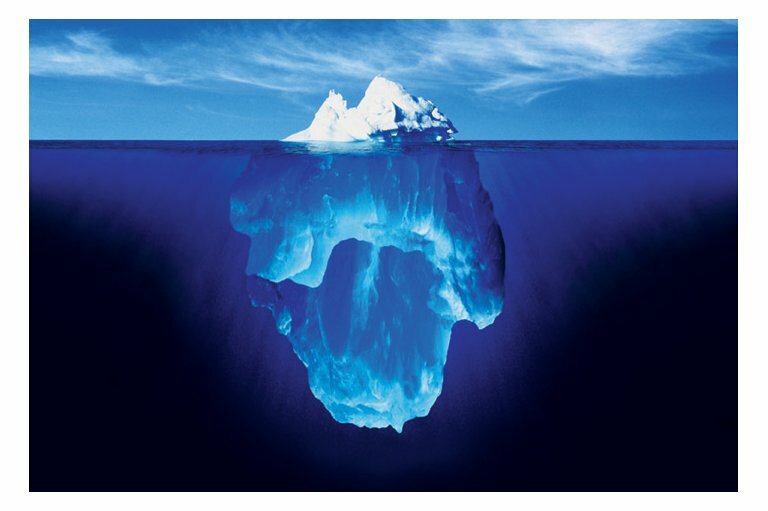 The majority of what we really feel and what is really going on for us is down below the waterline (both consciously and unconsciously) – below the tip of the iceberg. The invitation is to lower your waterline. To really let people know what is going on. What are you thinking? What are you feeling? What is happening right now? As soon as one person is really real it starts to give others permission to be real and to open up. In short it takes bravery and courage to move through the fear of vulnerability. But the results make it worth it – more satisfying relationships, better decision making, and a sense of personal and team growth, and ultimately more connection. In a longer talk Mike suggests that many of our communication problems are only a ‘ten minute sweaty palm conversation’ away from being addressed. Can we move through the discomfort and take the risk to be authentic and the vulnerability that this often entails? Personally, I am going to commit to having one of these difficult, sweaty palm, conversations this week. I would also be interested to hear other people’s experiences of lowering the waterline and suggestions of how to help people to be more real at work…. Bella Cranmore has a keen interest in Conscious Business having been a client of Conscious Business People in 2013-2014. Categories: Authentic, Communication, Congruence, Courage | Permalink. He had an idea. He felt it was very exciting because it was different and could even be important. But he didn’t know what to do about it. He didn’t talk to other people about it because he had learned that when he told them about it, they saw little in it for themselves, but a lot in it for him. Many of them just cut him down, directly or through faint praise, explaining how they could see that it wouldn’t work even if he couldn’t. That left him feeling silly. Even worse were the few who saw his idea and encouraged him, but they were no closer to knowing what to do about it than he was, so that left him feeling bad too. Smart enough to think up something, but not smart enough to know what to do about it, huh? One day, by chance, he found himself in the company of another man on a journey. After a while, this man asked him what his interests were. He was too shy to give a truthful answer, muttering abstractions and generalities that didn’t mean much. Doing otherwise always ended badly. But on this occasion the other man seemed able to read his hesitancy and be interested in what lay behind it. He gently persisted with his question as though he desired to learn something of his travelling companion. It was almost as if he was saying: ‘This is our opportunity. The Universe is large, but will still be richer for what we can make of this time. There is nothing to fear’. Eventually he caved in. He told his companion his idea showing the excitement he felt as he talked about it. The companion listened intently then asked some questions to make sure he had understood what he had heard. Then he commented on how important and valuable the idea was, but agreed it was hard to see what to do. At this he became very nervous again because the words he had to speak sounded ridiculous from such as himself, who had never moved in the circles of making such lofty things happen. But again it was as if the other man ecould read this and gently drew him out. And as the ideas poured out of him and were met with approval rather than ridicule, his confidence grew and he spoke with greater clarity and force. His companion grew more and more impressed and started to share the sense of excitement. He said: “They just call me EM”. Categories: Authentic, Business, Collaboration, Commitment, Courage, Creativity, Giving, Support, Trust, Truth | Permalink. As I start to write this I wonder if I am simply recycling old material. After all I have written about the conscious business approach to setting up new business relationships before and before that. But I recently came across an old article by Neil Rackham, of SPIN fame, called Avoiding the Traps in Selling Profesional Services (available here or email me if you can’t find it). Neil talks about the need for people selling professional services to be competent, concerned and full of candour. Is selling professional services the same as selling generally? I think so: as we move towards a meaning-based economy, where more and more traditional, and tangible, products are commoditised, then each day service becomes more and more the only true differentiator. Professional services involve helping the client understand their needs, as well as meet them. Again, in a meaning-based economy, helping someone understand their needs is increasingly a key part of any service. So lessons that apply to selling professional services increasingly apply to selling anything. And what are those lessons? For me, good selling is fundamentally about creating better relationships. Long-lasting, meaningful relationships. To do that the first step is to get away from some of our own assumptions about the buyer-seller relationship. For example, I think many business relationships start off on the wrong footing because there is a perceived imbalance of power. It is easy to fall into the trap of believing that a corporate buyer has all the power. They may believe this, but do they really? They can say yes, or no, to your offer. But so can you, to their terms. Perhaps you think you need them; but do you really? And do they also need you? They can hurt you or help you – damage or build your reputation. But can they really? Or is it just that you imagine they can? My experience is that the powerful corporate executive isn’t really as powerful as they may pretend. They can strut. Show off their toys. They can shout and storm. But at the end of the day they’re simply an employee. They don’t own anything. Instead, sometimes their lives are owned by the corporation. To achieve anything they need the buy-in of their colleagues, their bossess, their shareholders. Often they need to follow a process. Simply to arrange a cup of tea or buy a paper-clip. So, first, can you reset your perception of the relationship? I like to assume that the person I am dealing with is simply another human being. Just like me, trying to make their way in the world. Living within the constraints of their world, and trying make things better, for themselves, and for others. In other words, I’d rather approach this person with unconditional respect. Whatever their initial behaviour. Working inside a corporate organisation is difficult. It is frustrating: it isn’t easy to get things done. It is scary: there’s a lot of pressure – and a lot of misused power. So approaching this person with empathy – putting oneself in their shoes – can be a real help. We all know what frustration is like. And fear. Empathy is about seeing the world from their eyes, walking in their shoes. Experiencing that frustration and fear and seeing the world through that lens. In selling, as Neil Rackham points out, candour is also essential. In conscious business we might use a different word: congruence. In selling, as in all relationships I value, I must be honest. If I don’t know something, or if can’t do something I must tell the client. Congruence helps build relationships – not least because we all detect its opposite: inauthenticity. Being honest and open is also essential so that my company can be held to account for delivering the service I am selling. When I am selling I am responsible for helping the client gain the value they need from me. If I set things up wrongly at the beginning, I will surely jeopardise later success. Theirs and mine. I also need to tell clients what I think and how I feel about our relationship, especially about this power imbalance if it exists. That last may be very hard. Certainly, it may not be something we are used to doing. By I think it is the secret to successful selling – to creating that real, long-lasting relationship. Categories: Attitudes, Authentic, Business, Congruence, Courage, Empathy, Feelings, Meaning, Purchasing, Respect, Sales | Permalink. A recent news piece on BP’s behaviour in the Gulf of Mexico made me wonder about the use of the word ‘systemic’. I know it’s probably not what was meant. But when I read this article, “systemic” started, to me, to sound like an excuse. A reason why BP and others didn’t do what they could have. Should have. The first time I heard that word in relation to a disaster, or a scandal of some sort, it seemed to be properly used. Indicating that there are features of the system that make a problem likely to reoccur. That the problems are deeply entrenched in the design of the system, and that these conditions ensure that individuals often behave in certain ways. That we need to reform the system. Not just scape-goat individuals. But now, and maybe it is me, it begins to sound as if the word is trotted out whenever a major disaster or scandal occurs to absolve any individual of responsibility. “It’s the system’s fault, I couldn’t do anything!” comes the plaintive cry. “Never doubt that a small group of thoughtful, committed citizens can change the world. And where does that small group of thoughtful, committed people start? It starts, of course, with the individual. One individual needs to take a risk, change their way of thinking, say something others daren’t. An individual within a system is, I believe, the only thing that really can start to change a system. The individual is the catalyst for system-wide change. Somewhere, sometime, were there perhaps people in BP would could have said something and didn’t? Who went along with crowd-pressure and followed the herd mentality? When there was an opportunity to say or do something different? What does this all have to do with you and your business? Maybe you are in a business, running it or working at the front-line, and everyone blames everyone else? Maybe everyone is rubbish at their jobs. Maybe you don’t like the way the company is set-up or structured. Maybe your boss is an idiot. Maybe the reward systems are set-up to reward the wrong things. Maybe the company regularly does bad things, or allows poor quality work in the pursuit of short-term profit. If any of those things is wrong with the system – please don’t blame others. Don’t blame “the system”. Take responsibility. Change yourself. Be the catalyst. Be the change. Categories: Accountability, Attitudes, Authentic, Business, Change, Commitment, Conscience, Environment, Failure, Honest, Personal, Responsibility, Solution | Permalink. It takes me a while to get around to seeing new films, so it was only last night I watched the Age of Stupid. Apart from the very interesting way this film was funded (by more than 620 ordinary people investing getting on for £1 millon), I was most struck by a comment made by the lead character, Pete Postlethwaite, a few moments before we are fully introduced to the idea of our own ignorance and stupidity being the cause of our downfall (and, in the film, ultimate destruction). He remarks that maybe we humans don’t think we are worth saving. I find that a really powerful thought. If true, it would explain a huge amount of our behaviour, and not just that related to climate change. It would explain why we allow ourselves to get fat; why we work our socks off to earn stuff that rarely makes us happy; why we poison ourselves with excesses of alcohol and other drugs; why we kill each others’ children in endless wars. I’d like to see more businesses funding themselves through broader share ownership (Ben and Jerry’s reputedly did a great job of that in the state of Vermont). And I’d also like to see more business owners reflecting on what their businesses would be like if their purpose was genuinely to enhance people’s sense of self-worth – their own, and that of their staff, their customers and the public at large. For example, I think I could quite easily make a list of products and services produced by commercial companies that are, in self-worth terms, destructive, neutral, or positive. The most positive on the list, for me, would include services that encourage people to really get better at what they do; to introduce some kind of professional reflection into their working lives; and to engage more honestly and authentically with other people. And services that encourage creativity, imagination, and the appreciation of beauty and quality. All of these things, when done well and in a sustained manner, should lead to a better sense of real self-worth and self-esteem. I’d be interested to hear your lists too. By the way the same people responsible for the film are producing a (sillier?) daily 20 minute live web TV show, The Stupid Show, from the Copenhagen Climate Summit. Minimum sponsorship only £300 in case you are interested in getting into the TV business. Categories: Authentic, Business, Climate, Purpose, Self-esteem, Self-worth, Sustainability | Permalink. I said in my last post that business was a powerful means to develop and grow people. I have been mulling this a lot lately, and have been wondering what it would mean if that was the entire purpose of business? I can certainly see my own experience in that way. Working in business has brought me more challenges than pretty much anything else in my life. Firstly, the challenge of making a living. Secondly, learning to interact with all sorts of different types of people. Thirdly, doing all sorts of things I never would have imagined myself capable of. Maybe that shows what a sheltered life I have led; but it truly has been challenging. Even balancing the demands of work with the rest of my life has stretched me physically, mentally and emotionally. And yet at the same time it’s been a very safe place to learn. Scary at times, yes, but ultimately there has been little threat to life and limb. Along the way I have also come to very much admire the people who run small and medium-sized businesses. It seems to me that they take more real risks than those in big business. In a well-salaried, very senior position in a large corporation, yes, you can learn a lot. And yes, you can lose your job. But you are unlikely to lose your house, or your personal reputation. You’re just too well cushioned by salary, savings and a network that protects its own. Small business owners by contrast sometimes do lose everything, including their reputations with friends and family, and have to start again. There are few golden parachutes in the small business world. But back to the purpose of business. I know what I am suggesting is not for everybody. Some people do simply want to make money out of business. Others want to do something really, really worthwhile. But for others, including myself, I think the goal is actually personal development and growth. That may seem rather selfish. But I guess life ultimately belongs to each and every one of us. And we each have a choice to make, between what psychologists call hedonic and eudonic goals. With the former we choose to make pleasure and joy our aim; and we avoid pain. I understand the latter to be more about achieving a sense of fulfilment: a life well led, with real purpose and meaning, good relationships, good self-esteem and feelings of competence and self-control. If this is your life goal, then why not make small business your training ground? It will stretch you. You will need to learn new skills. You’ll need to become a specialist and a generalist – good enough at all things to be able to tell if you are wasting your own time and money. You’ll need to be an expert in human relations. Money won’t always pave your way. So you’ll need to develop and rely on much more human strengths: passion, persistence, and the ability to persevere when others would give up. You’ll need to learn new ways to lead – to help others discover their purpose and turn it into reality – often without recourse to coercive power. And most of all it will force you to be really honest, to really be yourself; it’s hard to survive and thrive in small business if you adopt and hide behind a role. When things get tough you simply have to reveal yourself if you want to gain and build trust. Only honesty and trust will get you through the difficult times, and help you create something truly sustainable. From this honesty and self-inspection you’ll also gain self-knowledge and self-esteem, and ultimately a sense of self-control and personal power. Surely that’s worth shooting for? Categories: Authentic, Business, Choice, Dialogue, Growth, Happiness, Honest, Leadership, Learning, Performance, Purpose | Permalink.